پژوهش حاضر، به بررسی نقش رسانه‌ها (تلویزیون، رایانه، کتاب‌ها و مجلات غیردرسی و ماهواره) در رشد هویت ملی نوجوانان پرداخته است. به این منظور، 440 نفر از نوجوانان مدارس راهنمایی و دبیرستان شهر تهران، به روش نمونه‌گیری خوشه‌ای چندمرحله‌ای به عنوان نمونه تحقیق انتخاب شدند. برای سنجش هویت ملی، شناخت علایم و نمادهای ملی، میزان استفاده از رسانه‌ها و ویژگی‌های فردی و خانوادگی، پرسشنامه‌ای محقق‌ساخته به کار گرفته شد و داده‌های پژوهش با استفاده از روش‌های آماری آزمون t، همبستگی اسپیرمن، تحلیل عاملی اکتشافی و رگرسیون چند‌متغیره مورد پردازش قرار گرفت. نتایج نشان داد میزان استفاده از رادیو‌ـ‌ تلویزیون و رایانه، رشد هویت ملی و شناخت علایم و نمادهای ملی را پیش‌بینی می‌کند. استفاده از کتاب‌ها و مجلات غیردرسی و پایگاه اجتماعی‌ـ اقتصادی، نیز پیش‌بینی‌کننده میزان شناخت علایم و نمادهای ملی هستند. The present study examines the role of media (TV, computers, books, magazines and satellites) in Adolescents’ National Identity growth. In this study 440 adolescents from Tehran’s guidance schools and high schools were selected using multi-stage cluster sampling. To measure national identity, identify signs and national symbols, the extent of media consumption, family and personal characteristics, we used a questionnaire. The research findings were processed using t-test, Spearman correlation, exploratory factor analysis, and multivariate regression. The findings show that the extent to which radio, TV and computer are used, predicts national identity, signs and national symbols. Using books magazines as well as social-economic networks also predicts the extent of knowledge on national signs and symbols. آخوندی، محمدباقر. (1377). بررسی هویت ملی و مذهبی جوانان و عوامل اجتماعی مؤثر بر آن. پایان‌نامه کارشناسی ارشد، مشهد: دانشگاه فردوسی. اسمی، رضا. (1387). نظرسنجی از نوجوانان درباره برنامه‌های صداوسیما. تهران: مرکز تحقیقات صداوسیما. بیابانگرد، اسماعیل. (1384). بررسی برنامه‌های کودک و نوجوان از منظر پرداختن به هویت و بحران هویت. تهران: مرکز تحقیقات صداوسیما. (215). جعفری کیذقان، طاهره. (1384). بررسی تأثیر تلویزیون بر هویت فرهنگی. تهران: مرکز تحقیقات صداوسیما. شرفی، ابوالفضل. (1377). بی‌هویتی و گرایش به غرب. پایان‌نامه کارشناسی ارشد، تهران: دانشگاه تربیت مدرس. محسنی، نیک‌چهره. (1375). شکل‌گیری مفاهیم میهن و بیگانه نزد کودکان 6 تا 12 ساله. تهران: معاونت پژوهشی دانشگاه تهران. محسنی، نیک‌چهره. (1383). نظریه‌ها در روان‌شناسی رشد. چاپ اول، تهران: پردیس. کریمی، یوسف. (1379). روان‌شناسی اجتماعی. چاپ هشتم، تهران: ارسباران. میرفخرایی، تژا. (1385). زبان، رسانه و بازنمایی هویت. فصلنامه پژوهش و سنجش، 13 (48). نیکو، مینو؛ سعیدیان، ایما؛ سرکیسیان، وازگن؛ شیخ، سعادت. (1381). شناخت مخاطب تلویزیون با رویکرد استفاده و رضامندی. تهران: سروش. Amadeo, J.; Torney-Purta, J. & Lehmann. R. (2002). Civic knowledge and Engagement: An IEA Study of Upper Secondary Students in Sixteen Countries. U.K: Amesterdam. Barrett, M.; Lyons, E.; Purkhardt, C. & Bourchier, A. (1996). English Children's Representations of European Geography. ESRC: Grant Number RooEO 235753. Barrett, M. & Short, J. (1992). Images of European pepple in a group of 5-10 year old English school children. British Journal of Development Psychology, 10, 339-363. Barrett, M. (2007). Children's knowledge, beliefs and feelings about nations and national groups. H: London: Psychology press. Cameron, J.E. (2004). A three – factor model of social identity, Self and Identity, 3, 239-262. Delamater, J.D., Myers, D. J. (2007). Social psychology, Sixth ed. London: Thomson Wadsworth. Devine-Wright. P., Lyons, E. (1997). Remembering pasts and representing places. Journal of Environmental Psychology, 17, 33-45. Harwood, J. (1999). Age Identification, Social Iidentity, Gratification and Television Viewing. Journal of Broad casting & Electronic Media, 43, I. 1. Himmelweit, H.T. ; Oppenheim, A. N & Vince, P. (1958). Televison and the child: An Empirical Study of the Effect of Television on the Young. Oxford: Oxford University Press. Hoffman, L.H. ; Thomson, T. L., (2009). The Effect of TelevisionViewing on Adolescents Civic Participation. Journal of Broad casting & Electronic Media, 53 (1). Holloway, S.L. ; Valentine, G. (2000). Croked hats and Coronation Street: British and Newzealand Children Imaginative Geographies of the other. Childhood, 7, 335-357. Katzs, E.; Blumler, J. G. & Gurevitch, M. (1974). Uses and Gratification Research. Public opinion Quarterly, V. 37, Clumbia University Press. Moscovici, S. (1976). Social influence and social change London: . Academic Press. Newman, P.; Newman, B. (1997). Children and adolescents dovelopment. London: Rutledge. Piaget, J.; Weil, A.M. (1951). The Development in Children of Idea of the Homeland and Relations to others Countries. 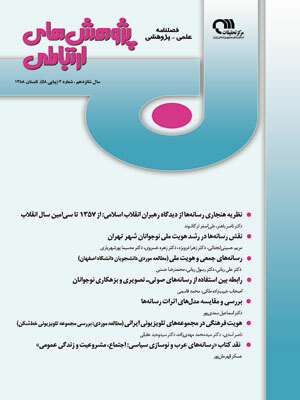 International Social Science Journal, 3, 561-578. Rutland, A. (1998). Social representations of Europe amongst 10-16 year old British Children. Social Representaions, V. 7 (1-2) 61-75. Smith, E. & Henry, R. (1996). An in Group Becomes Part of the Self: Response Time Evidence. Presonality and Social Psychology Bulletin, 22, 635-642. Tulviste, P.; Wertsch. J.V. (1994). Official and anofficial histories: TheCase of Estonia. Journal of Narrative and Life History, 4, 311-329.